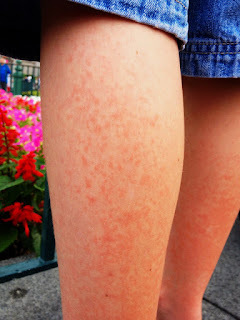 My youngest son inexplicably broke out in vicious hives all over his body yesterday while we were in Hong Kong for one last visit to Hong Kong Disneyland. Having a shrimp allergy myself (a miserable allergy to have in Asia! Thankfully it's not life-threatening), I never go anywhere without some Benadryl (diphenhydramine). So I gave some to Ben and then watched him like a mom whose other son actually does have a life-threatening allergy to something (Penicillin) to make sure he was still breathing normally. He was, and other than the hives and some mild itchiness, he was his normal perky self. So instead of a mad dash to the ER in Hong Kong, I waited until this morning to take him to his doctor in Macau. Dr. David (first name basis here) ruled out any illnesses that might cause a rash, and said it looked like what I'd expected him to say, it's some sort of allergic reaction. Now we are just trying to get to the bottom of what it might be. In the meantime, we've been loaded down with various medications and the best thing of all, Dr. David's personal mobile number with instructions to call him directly if anything changes, good or bad. This is the same Dr. David who happened to be at the company Christmas party where our older son put on one of those giant inflated sumo suits, slammed against his opponent, fell back and hit his head on the rock-hard ground just prior to blacking out for half a minute. 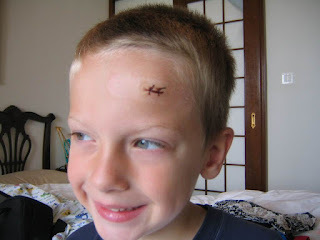 (Sidenote: While Nathan was the only kid to black out, several kids tried the same thing and hit their heads). Dr. David stepped out of party guest mode and into doctor mode to sit with Nathan for an hour to make sure he wasn't going to get fuzzy headed or throw up. And then told us if we needed to take him to the ER, he would graciously accompany us to the hospital and act as translator, and made sure we programmed his number into our phones. He called us twice in the night to make sure Nat was okay. As much as I really liked our doctors in the U.S., I have never had one of them give me their private numbers and offer to accompany us to the ER. Nathan has had a fear of medical professionals since he was four and split his forehead open in Beijing, necessitating stitches at the "best" hospital in the city. This was in 2005, prior to the Olympics, and I was horrified by what I saw. It was run down and looked like a set for a horror film. He wasn't sedated or even given something to numb the skin. We were told to "hold down" (the only English the doctor spoke) and then the butcher, er, doctor went at him with a huge curved needle and what looked like three strands of waxed dental floss. I held his upper body while Michael held his legs, so it was my face he saw, plastered with a big smile uttering cheerful phrases of encouragement to Nathan, while wanting to stab the man who was causing my child to howl with both pain and fear as the needle would rip through the skin. His stitches got bigger and bigger as the thread would tear through, until he was left with something straight out of Frankenstein. Fitting, considering the hospital's appearance. Later that night I had a nervous breakdown over the whole experience, laughing and crying hysterically out of control in the hotel restaurant. I locked myself in the bathroom, placing a really long distance, middle-of-the-night phone call to my own mom who patiently consoled me while I wept and howled myself. But while I had just an evening of losing my mind, Nathan went on to have years of fear, dread, and pure hatred toward people in the medical profession. Lest you think I exaggerate, there have been several times in the last six years where Nathan would get settled into the exam room at the doctor's office, in she would come with a friendly smile, ask him how he was, and like the Roadrunner, Nathan would shoot off the table, race out the door, exit the building, and be halfway down the block (sometimes running blindly through a busy parking lot) before I could catch up, tackle him to the ground, and sweet-talk him into going back for "just a look, not a shot, no one will cut you open." Other times, Nathan would shout verbal insults at the top of his lungs, which made me both blush in shame and feel a little bit proud that a five year old could have such a rich vocabulary for expressing displeasure. It doesn't help that Nathan is tall for his age and has always looked older than he is, which makes this behavior appear all the more outrageous. I remember asking one doctor about sedatives, and she said she didn't recommend them for Nathan. To be clear, I wasn't asking for drugs for Nathan. Six years worth of physically dragging your firstborn for simple check ups takes its toll on a mama. 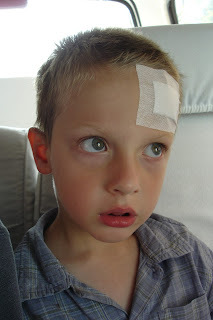 If you recall, when we first arrived in Macau, Nathan (the child who never gets sick) got very sick, many times. We took him to see Dr. Linda (more first names) who was patient and kind and really took the time to listen to Nathan when he said he was sure she was just going to cut him open and leave him to die. I'm a huge fan of Dr. Linda, who ended up seeing him three times in one week for a terrible stomach ailment and spiky fever. Miraculously, she managed to cure his never-ending fear and loathing toward doctors, along with the stomach bug. Macau is a small place, and we see Dr. Linda quite often in social settings as well as more casual places like the grocery market. Nathan decided he can trust a doctor if in fact they also do everyday things like shop for groceries and don't just spend all their time in evil workshops and dungeons, laughing about their latest plans to torture children. I will miss a lot of things about Macau. But Dr. David and Dr. Linda sit comfortably at the top of my list. They've made some suggestions of colleagues in the medical profession we can visit in Shanghai, so I go to China with even more confidence that everything is going to be okay. For people in Macau, the amazing Dr. David and Dr. Linda can be found at Hope Medical Clinic, which has offices in both Taipa and Macau.